I received my Doodle Dypes all-in-two diaper a few weeks ago, and it earned it’s spot in my pile of favorites right away! 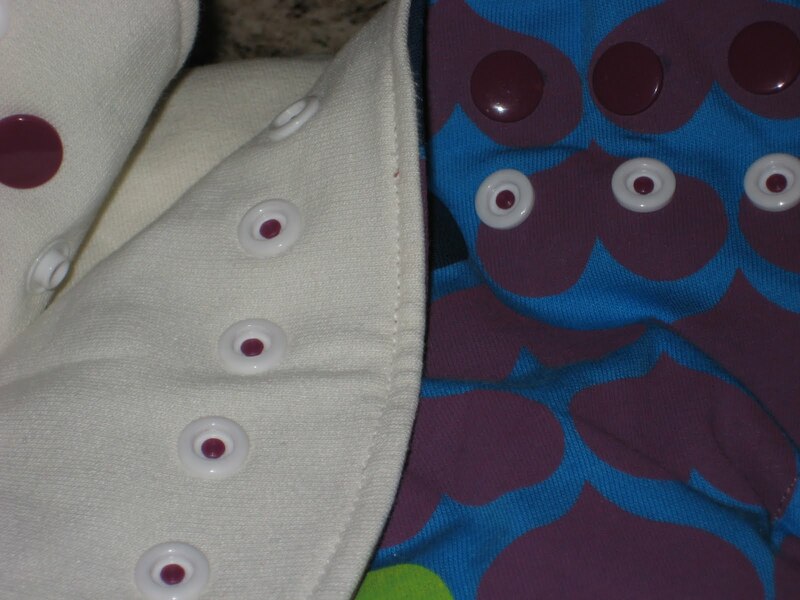 Sandy of Doodle Dypes makes many of her diapers custom to order. Mine has a cotton knit outer, hidden procare waterproof barrier and an organic bamboo fleece inner. I love this print! 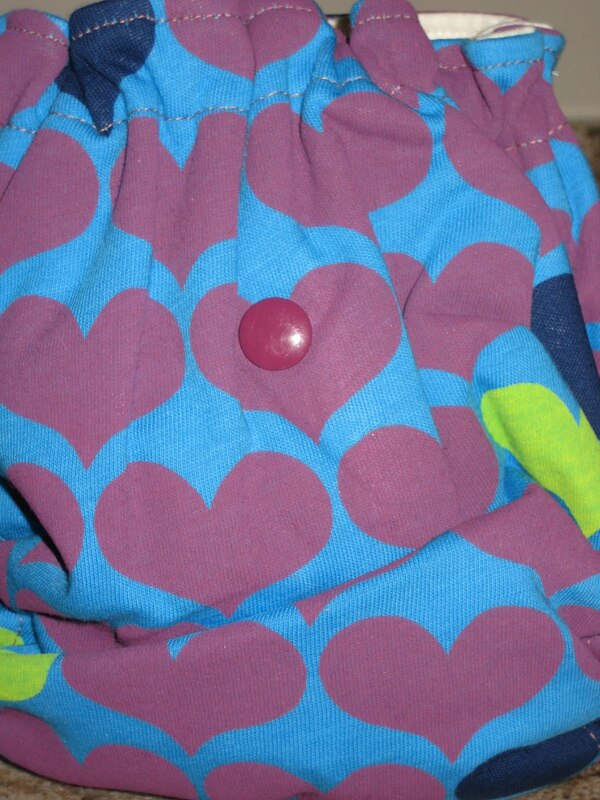 I think the blue makes it suit my son, but the purple hearts would work for a girl too. This is an AI2 with a snap-in soaker. You can overlap the wings to fit a slimmer baby. This definitely looks like a professionally sewn diaper, with even stitching and evenly applied snaps. It is a “one size” by way of a fold down rise. 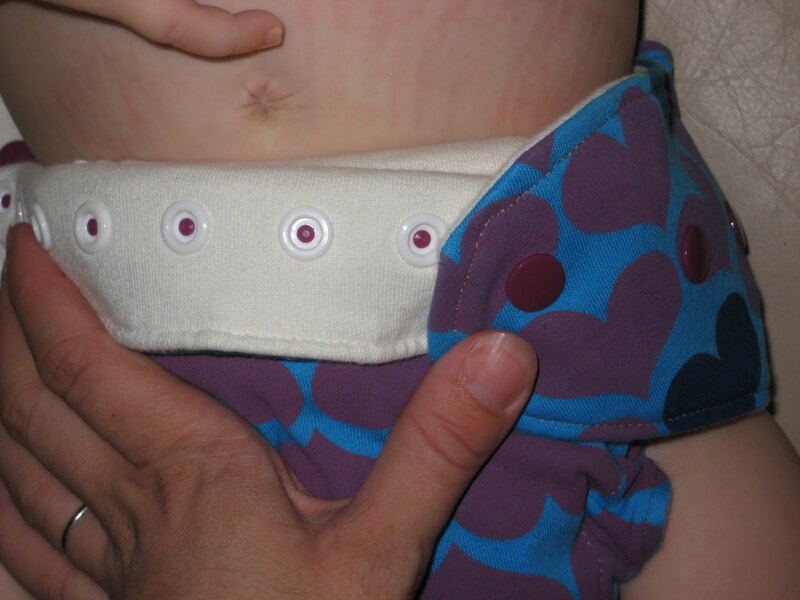 One thing that’s unique is that the second row of snaps are hidden (applied under the inner layer) so when you’re using this on a smaller baby, no snaps will touch his/her tummy. The all-in-two’s snap in soaker can give you 5-15 layers of organic bamboo fleece absorbency, depending on how you fold it. 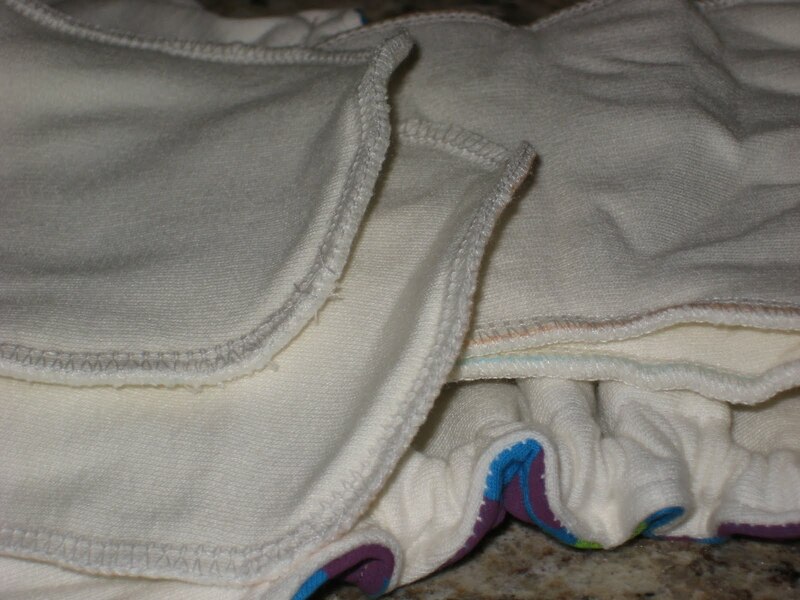 Organic Bamboo Fleece needs to be prepped (washed on hot & dried on medium heat 3-4 times) and will gain maximum absorbency after about 10 washes. Sandy pre-washes all of her fabrics before sewing, so you don’t have to worry about any uneven shrinking. Above is how you use the fold-down rise. I’m able to get a good fit with or without folding down the rise. The fit looks a little strange in that picture for some reason, but it’s not! It fits wonderfully around the legs too. I was anxious to get the diaper on him, so I only washed it once. Our Doodle Dype is in our regular rotation. In fact, my son is wearing it and sitting on my lap right now! 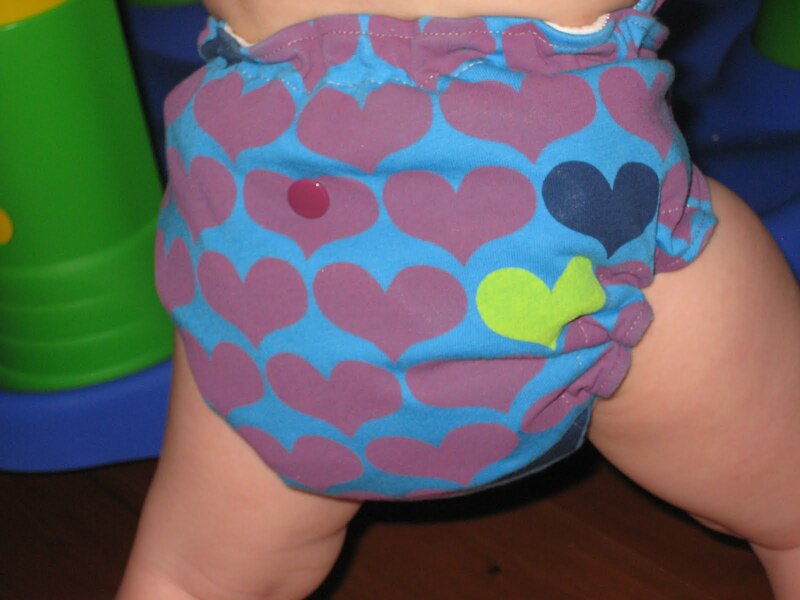 We have even used it on car rides with no leaking, and it doesn’t have the wicking (at the legs) issues that some diapers with a cotton outer & hidden PUL have! I do know that the cotton outer will fade and wear over time. That’s just the nature of a cotton knit fabric. A Doodle Dypes all-in-two will need to be changed at each diaper change, it isn’t the hybrid type where you can just change out a soaker. Each one retails for $20 and you can shop Doodle Dypes on HyenaCart and visit Doodle Dypes on Facebook! The diaper was provided to me free of charge for the purpose of this review. I was not requested or required to write a positive review, and all opinions are my own. I was not otherwise compensated for my review. Mailbox Mondays 12/27/10 Is there a Diaper English to Regular English Dictionary? >Wow, those are super cuteness and you can bet your bum my twins will be cloth diapered with prefolds.